1) This paper was presented at the joint FIG Commission 3 & 7 Meeting "Crowdsourcing of Land Information" in Malta, 16-20 November 2015. The paper focuses on road infrastructure and road use; more specific on the interactions between traffic participants and to help cyclists navigate safely in the urban environment. The paper aims at exploiting available VGI data sources in the form of crowdsourced base maps (OpenStreetMap) and GPS trajectories collected by cyclists (GPSies). Under the umbrella of Green and Smart Cities, much is done nowadays to provide cyclists with safe and sustainable road infrastructure. Since cyclists frequently share the same space with pedestrians and motorized vehicles, and since traffic loads continue to increase, understating the current state of the network is required on regular basis to allow future planning and modeling. Not all relevant information can be gathered with the exiting authoritative infrastructures or through surveys. A closer investigation of the road infrastructure and road use at larger scale is required to study the usage, the interactions between traffic participants and to help cyclists navigate safely in the urban environment. The use of Volunteered Geographic Information has proven its potential in road network analysis, mainly in respect to cars, thus motivation exists to show its capacity for the task of bicycle road network planning and modeling. This paper aims at exploiting available VGI data sources in the form of crowdsourced base maps (OpenStreetMap) and GPS trajectories collected by cyclists (GPSies). Spatio-temporal analysis of different bicycle travel factors was implemented for the cities of Amsterdam and Osnabrück using VGI only. This paper will present this analysis, focusing on the data mining potential and possibilities of using such data sources for extracting interesting information that otherwise could not have been accomplished. Residents of urban environments are turning to bicycles as an optimal alternative to move around cities, thus the number of citizens using bicycles for commuting is markedly increasing. One can point to traffic congestions, lack of parking space, improved cycleway infrastructure, and healthy lifestyle as reasons that encourage this trend. Much is done to provide pedestrians and cyclists with a safe and sustainable road infrastructure, often under the umbrella of Green and Smart Cities. Recent technological developments contribute to an overwhelming transformation in the way that geographic data, information, and knowledge are produced and disseminated. Volunteered geographic data collected by citizens encapsulates the idea of using the Internet to create, share, visualize, and analyze geographic information, envisioned via the use of numerous computing devices and platforms. This citizen science neogeography revolution has started to fundamentally transform how geographic data are acquired, analyzed, and used. These types of volunteered geographic data are available today via online platforms mapping projects, e.g., OpenStreetMap (www.openstreetmap.org), GPSies (www.gpsies.com). Among others, this has recently led to the development of generating maps of road networks from volunteered GPS trajectories. Though much is done in relation to vehicle road network maps, not much work has been done in this field in respect to other means of commuting, namely cycling. Investigating navigation characteristics of cyclists is possible when analyzing spatial patterns and travel behaviors. This can lead to the assessment of current use and hence future planning and modeling of road networks designed for bicycles. Most travel surveys are handled with questionnaires or surveyors positioned at main junctions. Since cycling is not as constrained to roads as vehicular traffic, having many route alternatives and shared roads, the above is impossible to handle, such that the required data can be surveyed only by following the cyclists’ movements, i.e., inspecting and analyzing the users' activities. Such that personal questionnaires are rarely effective here, since they are limited and coarse – spatially as well as temporarily. This paper proposes a working paradigm to mine cyclists' spatial patterns and behaviors via crowdsourcing volunteered data in the form of contributed spatial trajectories, which can be collected easily, straightforwardly, accurately and comprehensively, actively by the cyclists themselves using mobile devices. For this, this research employs two existing volunteered geographic datasets: GPSies (www.gpsies.com), storing GPS trajectories collected by citizens, e.g., cyclists, providing location and time data from smartphone sensors; and, OpenStreetMap (www.openstreetmap.org), serving as the road network infrastructure. The proposed methodology uses data pre-processing on the GPS trajectories to filter data- noise and -outliers, followed by vector-data alignment, which is aimed at handling the matching and arrangement of the GPS trajectories with the road network routes. Spatial data mining is employed to investigate and identify specific interesting patterns of cycle routes, e.g., route preferences, routing patterns and road-type use. Volunteered Geographic Information (VGI) refers to the collaborative accumulation of spatial data by individual users through a web platform (Goodchild, 2007). Typically, individual users collect this data for online mapping services or spatial-related websites, which assemble and store the data in databases and display them on maps. Contributed information, such as GPS, traces of cycling routes or trips through places of interest, can be generated in a variety of ways and tools (Castelein, 2010). The project OpenStreetMap (OSM), for example, demonstrates the feasibility of individuals to create a massive geographic data source – map of the world – that can be used for multiple applications (Neis and Zielstra, 2014). It is common that even commerce companies, such as TeleAtlas, NAVTEQ, and TomTom, ask their users to help update their maps voluntarily (Coleman et al., 2009). Though VGI often has a lower quality than authoritative data in terms of completeness, thematic granularity, and homogeneity, it can be a rich source of complementary information (e.g., Jackson et al., 2010; Sosko and Dalyot, 2015). In particular, VGI can provide information on vernacular places or local knowledge, which often is not represented in maps, although heavily used by people in their daily lives. Several researchers (e.g., Arampatzis et al., 2006; Newson and Krumm, 2009) have investigated the automatic extraction of such information. Though OSM offers a special map for cyclists (via the OpenCycleMap website), it still lacks important attributes, e.g., for estimating a bicycle level of service (Hochmair et al., 2015). Bicycle navigation systems (e.g., Geowiki or Ride The City) are far from complete as relevant data is missing and existing network maps and routes collected by users are incompatible. To achieve a comprehensive picture, information on personal experiences needs to be acquired. In the context of cycling, Kessler (2011) investigated the degree to which VGI has been assimilated by cycling groups using three web services designated for cyclists. The author argues that despite the benefits of crowdsourced VGI for this purpose, in most cases this information remains useless online. Geospatial analysis of bicycle information can assist in evaluating road-type use in terms of their potential to facilitate bicycle activity. Such an analysis can be used to assess how certain factors, such as infrastructure characteristics, affect choices of cyclists (Hwang et al., 2013). Moreover, volunteered cyclist data can help in processes related to transportation and commuting planning (Smith, 2015). Large volumes of movement data have recently become available, as positioning sensors have become small and cheap and users share their trajectories online (i.e., sequences of positions with time stamps, usually recorded with GPS, via OSM, for example). Analyzing trajectories or, more generally, movement data has become a major research area in spatio-temporal data mining (e.g., Andrienko and Andrienko, 2005; Laube, 2014). Trajectory-based approaches to understand route choices of cyclist (Hudson et al., 2012) and pedestrians (Millonig and Schechtner, 2008) have been presented, yet mainly with a focus on the gathering of data. Based on bicycle trajectories and repeated shortest path computations in a given network representation, Hood et al. (2011) succeeded in automatically estimating the parameters of a model for bicycle navigation. Their model relies on the assumption that a route that is optimal for a cyclist corresponds to a path of minimum total weight in a graph, that is, the cost of a path is defined based on a sum of edge weights. Furthermore, Hood et al. assume that the weight of each edge results from a weighted sum of several attributes, e.g., length, the number of turns, and slope. The aim was to define the coefficients of the weighted sum (i.e., the attribute weights) such that the routes resulting from shortest path computations and the actual routes of cyclists recorded with GPS have a maximal overlap. Chen et al. (2011) argue that the most popular route can be derived with statistical analyses from routes historically generated by many other vehicles. Given all existing routes between origin and destination, and the amount of travel, the most popular route can be determined using popularity functions. The assumption made is that a route extensively used is more likely to be convenient, user friendly or popular. In the contexts of cyclists, relying on route use is much more significant, since convenience and safety play an important role in the choices of cyclists. One of the major problems of route-pattern mining (or trajectory analysis) is spatial and geometric inconsistency of GPS tracks that can be caused by GPS receiver inaccuracies, discontinuity or noise in the data. Such problems can cause difficulties in map matching, which means finding points and connecting paths in a road network model that correspond to the vertexes and edges of a trajectory, respectively (Brakatsoulas et al., 2005). Dalyot et al. (2012) presented a solution to the problem of finding and resolving spatial inconsistencies in different vector databases using a geometrical adjustment approach. In the context of vehicles and road network, Cao et al. (2005) present a solution for the matching problem. The authors used a heuristic approach to detect frequent areas, using characteristics of patterns defined by spatial areas around line segments. The geometric shape was translated to a mathematical definition, i.e., defining road sections as line segments with buffers around them. This representation allows GPS tracks (point entities) to be spatially associated with corresponding roads (line entities) despite inconsistencies and incompatibilities. Haunert and Budig (2012) addressed the matching of GPS trajectories with a road network in which roads are missing. The authors have extended the map-matching algorithm introduced by Newson and Krumm (2009) that is based on a hidden Markov model and a discrete set of candidate matches for each point of the trajectory. The transportation network infrastructure (road network) for the two case studies used as a base map is downloaded from the OSM database (updated for June 15th 2015). OSM uses the “Highway” tag to represent all roads, routes, ways, or thoroughfares on land, i.e., all roads/paths used by motorized vehicles, cyclists, pedestrians, public transportation, and others (excluding trains). The “Highway” tag contains several sub-tags, where the ones used here are detailed in Table 1. The “Cycleway” sub-tag is designated for cyclists only, and mostly will exist as a segregated road on the map. However, lanes allowed for cyclists are sometimes aggregated into a single road (and do not appear separately), which is classified under an alternative sub-tag category - "Primary". These roads can have separated cycle lanes, or one shared road. In these cases, if inserted by OSM users, the sub-tag is indicated by an additional tag "bicycle=yes". Still, this additional information is often missing, though in some countries or areas it is available, and hence possible to be extracted. Analyses stages are as follows: first, a statistical analysis is performed according to the main “Highway” tag (section 4.1.1), concerned with information to whether designated cycling routes exist, derived from the default settings of this category as given in OSM. Second, a more comprehensive statistical analysis is performed, according to the “bicycle=yes” tag, using all available sub-tag data (section 4.1.2). Table 1. Tags used in OSM base map for roads describing where cycling is allowed – and where not. "Unknown" refers to roads not defined in OSM, i.e., it is unknown whether cycling is allowed – or not. All road downloaded OSM segments and their attributed data are converted to ESRI's shapefile file format (“.shp”). The two study areas analyzed in this research are Amsterdam, The Netherlands, and Osnabrück, Germany; both cities are known for their massive cycle use and well-established and developed cycleway infrastructure. It is assumed that these cycle-friendly cities can serve as good case study for the paradigm presented here. Usage data of cycling trajectories for both cities are downloaded from GPSies, which is a relatively well-established online repository of volunteered GPS trajectories free for download. “Cycling” and “Mountain bike” trajectory types are used, supposedly representing routes used and collected by cyclists only. All trajectories for both cities are downloaded as “.gpx” file format, and converted into “.txt” file format using the GPS Visualizer online convertor (www.gpsvisualizer.com). The downloaded data are referenced to geographic WGS84 reference system, presented using (φ, λ) position coordinates (latitude and longitude). All data are then transformed into a local projected one to be used in a local metric projection. The reference system used for Amsterdam is the Dutch spatial reference system Amersfoort/RD New (EPSG or SRID (Spatial Reference System Identifier) ID is 28992). For Osnabrück, the reference system used is WGS84 UTM Zone 32N. OSM reference road infrastructure and superimposed GPSies trajectories of both cities are depicted in Figures 1 and 2. Figure 1. GPSies trajectories (in black) and OSM roads (in grey) for Amsterdam. Figure 2. 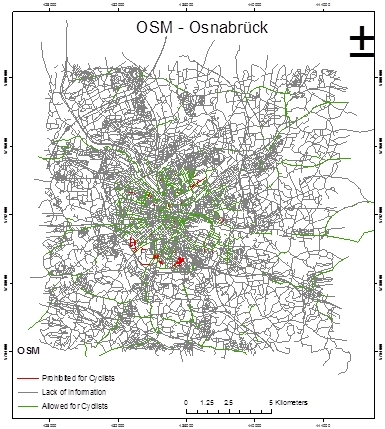 GPSies trajectories (in black) and OSM roads (in grey) for Osnabrück. To ensure reliable data is processed, filtering of noise and outliers is carried out on all GPS trajectories using a Matlab code. All trajectories generated after this pre-processing stage are transformed into polyline features for further processing. Due to the fact that not all GPS trajectories have a time stamp, movement-related parameters are not always feasible to handle for pre-processing task. Thus, the use of a distance parameter is used between two consecutive positions in a single trajectory, assuming it can be too long (far apart); in case it is long, most evidently both locations do not represent correctly the used route. For this, the Euclidian distance d between two consecutive trajectory points is examined using a given threshold e. If the distance d between two examined points i and i+1 is found to be larger than the threshold e, the original trajectory is split into two segments, resulting in two sub-trajectories. At the end of this process, each point is a part of a single sub-trajectory, and is assigned its unique number. This procedure ascertains that large clusters of points are separately segmented according to the required resolution (determined by the threshold). Figure 3 depicts the segmenting of a trajectory based on the distance criterion e. In this study, the assumption is that data in the GPS trajectory is collected with a time-resolution of 1 to 2 seconds, thus a distance threshold value (e) of 20 meters is used (this value was later ascertained by the map-matching algorithm). This value corresponds to the commonly used maximum velocity value of cyclists in urban environments, which is normally less than 10 meters per second (Zhang et al., 2011). Figure 3. Original trajectory segmented into two new sub-trajectories, indexed 1 and 2, according to the distance criterion e.
Short trajectories, which might introduce noise and outliers to the overall process, should be removed. Thus, the number corresponding to the total number of points in the sub-trajectory is examined, using a threshold for the required minimum number of points. In this study, this threshold is set to 30 (points), which translates to a relatively short trajectory of roughly 150 meters in length – a distance that is assumed to resemble a single route taken by a cyclist, and is based on an average velocity value of approximately 5 meters per second. In case a trajectory segment contains fewer points than this value, the segment (sub-trajectory) is removed. Figure 4 depicts a short trajectory - b – that is removed from the database according this criterion. This procedure verifies that considerably long and trajectories that are more significant are kept, relating to the road network geometry and its segments, while filtering trajectories that otherwise would have introduced noise to the analysis. Figure 4. Sub-trajectories a and c are kept, while sub-trajectory b is removed due to the small number of points (n=3). Since GPS-data is accurate to 10 meters in position, it is obvious that the trajectories are not positioned precisely on the roads. To carry out the analysis, trajectories should be assigned to a road. To solve the matching task, this study adopts the HMM-based map-matching algorithm proposed by Haunert and Budig (2012), which proved to be a reliable method for the problem of matching a GPS trajectory with a road data set. We review the method in this section and discuss its suitability for our purpose. This algorithm can be classified as an offline map-matching global optimization algorithm, since it requires the entire trajectory dataset as input, and also as a topological map-matching algorithm, because it allows a user to constrain the output path to the given network. However, because the algorithm allows some GPS points to be left unmatched, it is relatively robust against missing roads or, more generally, incomplete or outdated network models. This is particularly important when matching trajectories of cyclists with a general-purpose network model, i.e., a model not focusing on a particular mode of transport. Furthermore, we think that it makes sense to tailor the probabilistic model underlying the algorithm to a certain mode of transport, for example, to define that candidates on a motorway are very unlikely if the GPS trajectory was recorded by a pedestrian. In the current implementation of the algorithm, however, the road type is not taken into account. The algorithm decides whether the existing class of a road edge should be kept or the class of a corresponding trajectory edge should be assigned to that road edge. Figure 5 depicts two examples for matching results of the algorithm. Figure 5. 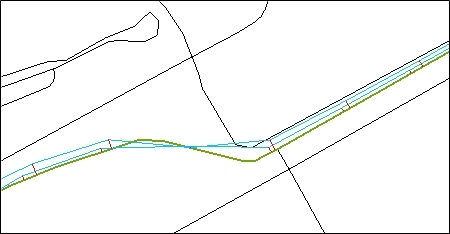 Two cycling traces (light blue) matched to the OSM base map roads (black) and the final road match result (green). The algorithm handles the matching of a single trajectory even when the trajectory is deviated to an adjacent road, or when the trajectory does not go through a junction. Since matching works on segments level, OSM polylines are split at intersections. This is done on input lines or polygon boundaries that touch, cross, or overlap each other at locations; each of the split lines become an output single line feature (segment). This procedure is employed to ensure that each OSM road segment (polyline) is assigned with the sub-trajectory value it is matched (aligned) to, even if the entire sub-trajectory does not completely overlap it, as depicted in Figure 6. Figure 6. A single OSM road polyline (green line, ID=1) is split according to intersections with the result of the map-matching algorithm (red dashed polyline) into three segments (ID=11, 12, 13). For the city of Amsterdam, roads with a total length of approximately 4,529.7 kilometers were obtained from OSM. For the city of Osnabrück, roads with a total length of 3,140.2 kilometers were obtained. Data obtained from GPSies are depicted in Table 2. Table 2. Trajectories obtained from GPSies for the study areas. To investigate the space cyclists share with other commuters (e.g., pedestrians, drivers), the OSM base map roads were divided into three categories based on the “highway” tag: roads cycling is allowed (“allowed”); roads cycling is not allowed (“prohibited”); and unclassified roads, which have missing definition regarding cycling permission (“unclassified”) (see Table 1). Due to missing information regarding the “unclassified” roads, this category was separately analyzed to avoid biased results. Figures 7 and 8 depict the classification according to these three categories in Amsterdam and Osnabrück, respectively, after the implementation of the matching algorithm. Figure 7. 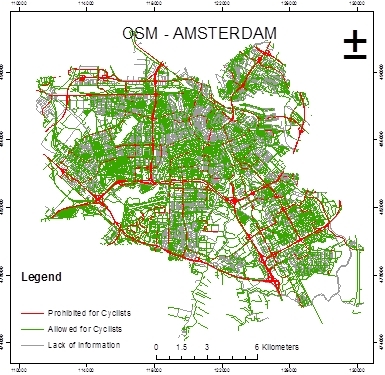 OSM base map of Amsterdam showing roads allowed for cycling (in green) and prohibited (in red). Figure 8. OSM base map of Osnabrück showing roads allowed for cycling (in green) and prohibited (in red). Tables 3 and 4 describe the road-type use of cyclists in Amsterdam and Osnabrück, respectively, after the implementation of the matching process. Again, types were classified into three categories: allowed for cyclists; prohibited for cyclists; and unclassified (unknown). These tables give a general picture of road-type use. Table 3. Road-type use in Amsterdam according to general classification: allowed (bold), prohibited and unclassified (grey shaded). Usage values below 1% are not presented. Table 3 shows that the total bicycle usage percentage of designated cycle roads in Amsterdam is 76.6%, whereas prohibited road usage is 8.5%; the latter is a relatively small number, but still one that should be addressed by planners (translates to a total length of close to 70 km of roads). The total cycle-use percentage of unclassified routes stands at 15.0%. In general, it can be concluded that with the data analyzed, cyclists prefer using cycle- designated and friendly roads. Table 4. Road-type use in Osnabrück according to general classification: allowed (bold), prohibited and unclassified (underlined). Usage values below 1% are not presented. Table 4 shows that the total bicycle usage percentage of designated cycle roads in Osnabrück stands at 74.7%, very similar to the value in Amsterdam, whereas prohibited road usage stands at 16.2% (double the value in Amsterdam). The total-cycle use percentage of unclassified roads stands at 9.1% (approximately 140 km). The highest rate in Amsterdam (50.0%) is associated with cycleways, whereas in Osnabrück the highest rate (36.9%) is associated with residential roads. Such differences can be explained by the different infrastructure development, urban planning policies or financial investment in cycle routes. Further analysis of the roads cyclists share with pedestrians and vehicles was applied to investigate the potential risks of users. In the shared roads of cyclists and pedestrians (i.e., Footway, Path, Living Street and Pedestrian), the pedestrians are relatively more vulnerable. On the other hand, when cyclists share roads with vehicles (e.g., Primary Road, Motorway), they are more exposed to physical injuries. Table 5 shows the distribution of shared-roads usage between roads allowed for cycling and roads which are prohibited. Numbers show that the total percentage of shared roads is fairly high, mostly with vehicular traffic, and mainly in Osnabrück, reaching more than 70%. Another interesting element is that although majority of shared-roads are designed to allow cyclists use – between 60-80%, still roughly more than 20% of these roads are still used by cyclists although prohibited. Table 5. The distribution of shared-road usage between roads allowed and prohibited for cyclings in Osnabrück and Amsterdam. When considering the OSM base map, the results show that a relatively large number of roads is tagged as unclassified. In Amsterdam this rate stands at 12.7% and in Osnabrück at 8.0%. It is unclear to which type of travel mode such roads are designed for, and whether cyclists are allowed to use these roads. In fact, in several cases, an analysis showed that cyclists, pedestrians and vehicles simultaneously use unclassified roads. Figure 9 shows unclassified roads in Amsterdam, in which cyclists and vehicles share the same space. For this reason, the unclassified roads were not taken into account in the analysis. Figure 9. Unclassified-type Amsterdam streets Keizersgracht, Runstraat and Huidenstraat, showing evidence of bicycle activity: Google maps (top-left), OSM (bottom-left), Google maps imagery (right). Abovementioned in Table 1, another classification was applied in Osnabrück to further investigate the urban space cyclists share. This time, OSM base map roads were divided into four categories: roads designated for cyclists only (“Cyclists”); roads cyclists share with pedestrians (“Cyclists-Pedestrians”); roads cyclists share with motorized vehicles (“Cyclists-Motorized”); roads cyclists are not allowed to use (“Prohibited”). This analysis was applied using the classification of “bicycle=yes” tag indicating where bicycles are permitted. This data was available for only 45% of the roads; in the other 55%, data was missing. Still, the feasibility of the method in detecting and classifying the space cyclists share with other modes of travel is proven. The results in Table 6 clearly show that in Osnabrück cyclists commonly use road infrastructure specifically designed specifically for them (43.4% of the usage). Nonetheless, cyclists still use shared infrastructure to commute (56.4%), thus making themselves vulnerable in case shared with vehicles (26.1%), or putting pedestrians under risk (30.3%). An interesting fact is that cyclists only rarely use prohibited roads (0.2%), which is a very important information, proving the maturity and availability of the existing road infrastructure. Table 6. Road-type use in Osnabrück according to classification: designated cycleways, roads cyclists share with pedestrians; roads cyclists share with motorized vehicles; and roads cyclists are not allowed to use. This paper is focused on exploiting crowdsourced VGI, namely GPS trajectories collected by cyclists, as well as road infrastructure collected by citizens, to extract semantic information and to analyze road-type use. The proposed analysis was applied using data of the cities of Amsterdam and Osnabrück, proving its feasibility and reliability even when certain data are missing or ambiguous. The road-type-use analysis included a classification phase, in which the road usage was classified into categories to investigate the space cyclists share with other road users. Results showed that most cyclists are using designated infrastructure (i.e., cycleways). However, a significant part of the usage is associated with other road types, designed for other modes of travel (namely, pedestrians and motorized vehicles), with rare use of prohibited roads for cyclists – though still exists. Despite the problem of data incompleteness, we conjecture that road-type use of cyclists' behavior can be successfully and reliably determined by the use of the proposed methodology. Patterns of spatio-temporal behavior and road-type-use classification need to be further investigated. The detection of preferences against certain road segments is suggested by analyzing the routes taken by cyclists. This can be achieved by spatial analysis (travel behavior and pattern recognition) of the different road segments. Hence, the plan to derive the characteristics and patterns of bicycle traffic depending on location and time to extract "road-usage" characteristics of the network. For example, if a road segment is infrequently used, one may conclude that the road segment is systematically avoided by cyclists or prohibited for them. This conclusion would be more justified, however, if it is found that cyclists make detours bypassing a segment. Reasons for such behavior should be also analyzed in respect to places and areas of interest, and the way people perceive them. It is believed that such an analysis can be made with the use of volunteered geographic information. 5. Castelein, W., Grus, L., Crompvoets, J., Bregt, A., 2010. A Characterization of Volunteered Geographic Information. In proceedings of the 13th AGILE International Conference on Geographic Information Science. 6. Chen, Z., Shen, H. T., & Zhou, X., 2011. Discovering Popular Routes from Trajectories. In proceedings of the 27th International Conference on Data Engineering (ICDE), pp. 900–911. 9. Goodchild, M. F., 2007. Citizens as Sensors: The World of Volunteered Geography. GeoJournal, 69(4), pp. 211–221. 17. Laube, P., 2014. Computational Movement Analysis. Springer Briefs in Computer Science, Springer-Verlag, Berlin, Germany. 19. Neis, P., & Zielstra, D., 2014. Recent Developments and Future Trends in Volunteered Geographic Information Research: The Case of OpenStreetMap. Future Internet, 6(1), pp. 76–106. 22. Smith, A., 2015. Crowdsourcing Pedestrian and Cyclist Activity Data.‏ Pedestrian and Bicycle Information Center, Chapel Hill, North Carolina.